Part Used & Method for Pharmaceutical Preparations: The roots are dug in October and can be used raw or baked. 1. Qi stagnation in the spleen and stomach manifested as poor appetite, epigastric and abdominal distension and pain, borborygmus and diarrhea. Costus root (Muxiang) is used with Poria (Fuling), Bitter orange (Zhiqiao) and Tangerine peel (Chenpi). 2. Damp-heat dysentery manifested as tenesmus and abdominal pain. 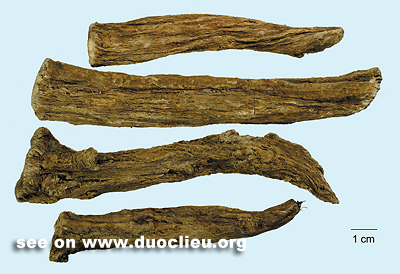 Costus root (Muxiang) is used with Rhubarb (Dahuang) and Areca seed (Binglang) in the formula Muxiang Binglang Wan. Cautions & Contraindications: The raw herb is used for qi stagnation, and the baked herb is used for diarrhea.